More than ever it is critical for doctors to understand the importance of managing patient expectations, and understanding the variance from patient to patient. Using inadequate communication in some instances may result in exposure to complaints. International research has demonstrated that through individualised training in standardised techniques, doctors have the capacity to improve their communication skills performance, enhance patient satisfaction and improve health outcomes. In the Patient Communication Skills Masterclass, a highly trained Cognitive institute facilitator helps participants review their individual communication technique, analysing areas for improvement. With feedback and guidance from the facilitator on particular patient cases and scenarios, each doctor is given the opportunity to identify areas they know cause them difficulty or anxiety. Actors are used to focus on these areas so doctors can target important skills for improvement. The facilitator helps each doctor break down the flow of the conversation by analysing areas for improvement while keeping focused on patient needs during these interactions. 1 day programme, made up of two sessions incorporating lectures and facilitated sessions with actor-simulated patients working on cases generated by individual participants. Cognitive Institute faculty are senior clinicians with over 20 years’ experience. They have attained accreditation after undertaking intensive formal training, and are skilled in the delivery of education to healthcare professionals, organisation-wide. Each of our faculty are drawn from differing health backgrounds and offer a rich and diverse experience of health service delivery and education. They have delivered and supported implementation of courses and programmes in a range of public and private healthcare organisations across the Asia Pacific and United Kingdom. Cognitive Institute courses are CPD accredited with most colleges. Learn more. Participants will be provided with a certificate of completion on request. 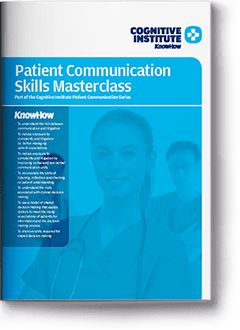 The Patient Communication Skills Masterclass is ideal for doctors. Specialty or needs-specific clinical cases are provided to match the audience, including cases specifically for the needs of overseas trained doctors. Please note: In masterclasses, all cases for actor-simulated patients are targeted and depict clinical situations specific to the craft group of the audience. As a result, audiences of mixed medical specialties OR of mixed healthcare professionals are not possible. This course is ideal for a team within your organisation. Minimum numbers apply. If you are seeking a course for yourself or an individual, please consider the Clinical Communication Programme or One-on-One Training. improve skills required for shared decision making. Please contact us to find out more about the costs to facilitate this workshop for your team or within your organisation. 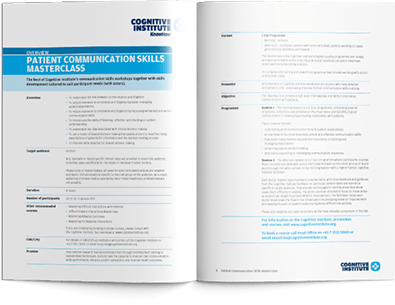 The best of Cognitive Institute’s communication skills workshops together with skills development tailored to suit participant needs (with actors). Please use this form to register your enrolment in this course and a member of our team will be in touch. Before registering, please ensure you have read and agree with the terms and conditions. Cognitive Institute reserves the right to cancel the course if the minimum number of registrations is not reached. A full refund will be provided. All materials are made available for personal use only and are subject to copyright.